Living in the past, holding onto grudges, and not letting go of anger seriously affect people’s lives and overall happiness. When it comes to dealing with our emotional baggage, many of us have a challenge because we either deny the obvious, pretend everything is ok or are blinded to our issues. And so, we may find ourselves wearing a mask to hide what’s going on, deep within us. Talking from experience, it takes more effort to keep up the facade than dealing with one’s excess weight. Have you ever ponded how our past memories becomes part of our sense of self? Recently I read a very short story which beautifully illustrated the inability or rather unwillingness of the human mind to let go of the part. It was quite an eye opener, a profound message simplified through a short story to understand the chain of facts and the main current of idea it delivered. Tanzan and Ekido were walking along a country road that had become extremely muddy after heavy rains. 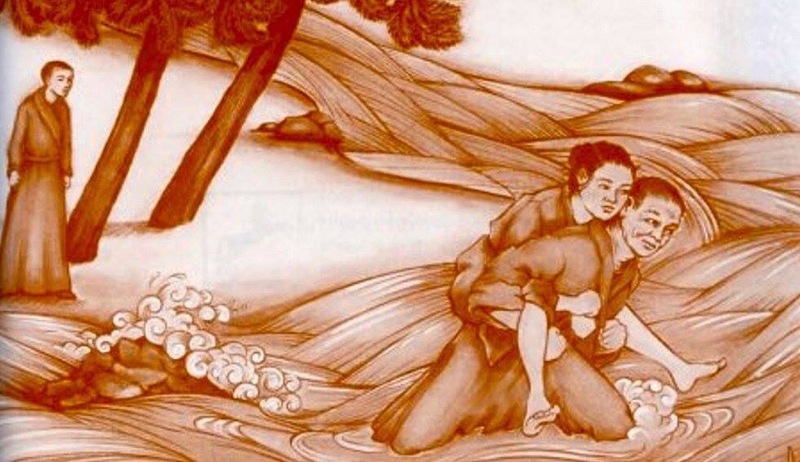 Near a village, they came upon a young woman who was trying to cross the road, but the mud was so deep it would have ruined the silk kimono she was wearing. Tanzan at once picked her up and carried her to the other side. The monks walked on in silence. Five hours later, as they were approaching the lodging temple, Ekido couldn’t restrain himself any longer. The majority us live a life like Ekido all the time. I call such situation as “Indian Tele serial” unable or unwilling to let go internally of situations, accumulating more and more “stuff” inside without speaking it out and creating the suspense and drama like in Tele serials. Not only do we get taken over by unhappiness, but we want to make others just as miserable as we are in order to feed on their negative emotional reactions. That’s exactly how most of us live!! Through past memories we learn past mistakes. What we always fail to understand is that it is only when memories, that is to say, thoughts about the past, take us over completely that they turn into a burden, turn problematic, and become part of our sense of self. Our personality, which is conditioned by the past, then becomes your prison. Our memories are invested with a sense of self, and our story becomes who you perceive ourselves to be. This “little me” is an illusion that obscures your true identity as Presence. We must learn to break the habit of accumulating and perpetuating old emotion and refrain from mentally dwelling on the past, regardless of whether something happened yesterday or thirty years ago. We must learn not to keep situations or events alive in our minds, but to return our attention continuously to the current present moment rather than be caught up in mental Indian Tele serial making. By focusing on today, Presence becomes our identity, rather than our thoughts and emotions. It is a true say that “This, too, will pass” When things are bad, it won’t always be this way. When things are good, it won’t always be this way either. So be Present and enjoy every great moment. We can’t undo whatever had happened in the past, neither can it prevent us from being present now; and if the past cannot prevent you from being present now, what power does it have? Previous Post Which prints, pattern and strips work best for your body?